Weather Report: Sunny and light to strong winds. Low 48, high of 90, but most hikng in the low to mid 80s. Very dry. Wildlife seen: A caterpiller. A rosy boa. 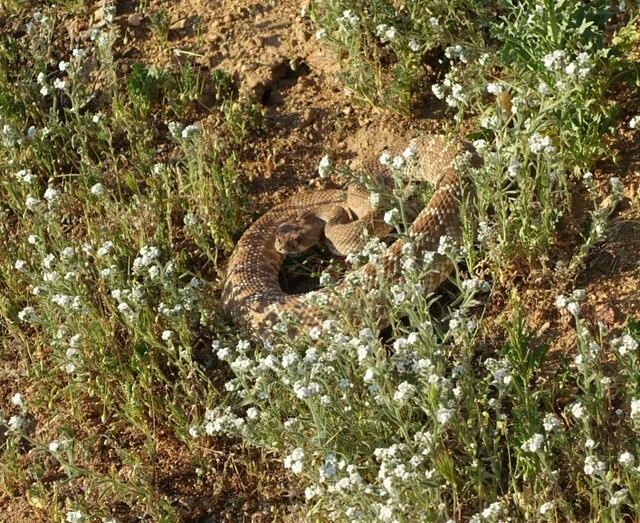 A rattlesnake. Woke up at 6 after some strange dream (had a bad allergy attack last night, took an Allegra at bedtime, Allegra gives me very strange dreams.) Loved the stillness, and scooted out at 6:45 to meet Chris at Scissors Crossing for Marmot Shuttle Service into Julian. Ate a hearty breakfast at the Julian Cafe Finally got my omlette, embellished with avocado, spinach, green peppers, and tomato... and drank four cups of coffee. Wheeee! I hope I didn't bore the table, I just kept on going and going. I also noticed something strange: I could really see well inside, or read the menu. It just seemed very dark, have I been out in the sun that long? Yes. We all headed back down the hill east, and I got back on the PCT after showing Eric and his family various little bits of gear, like the umbrella and hiking poles and all. Then I bid them and Chris farewell, and headed up the trail. 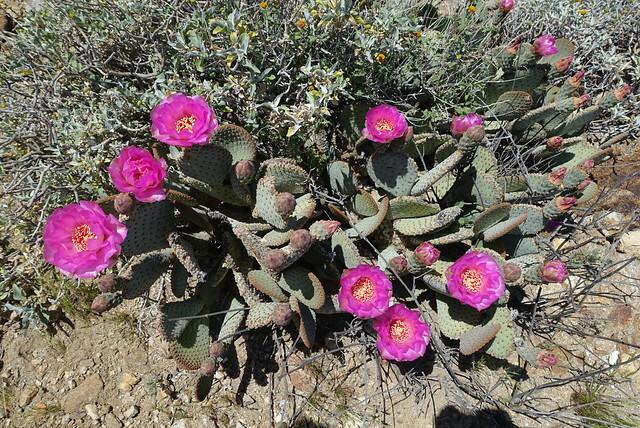 Those first few miles--say from mile 77 to mile 80--were spectacular, filled with lots of agave and cactus and a few octotillo, with wildflowers scattered underneath. 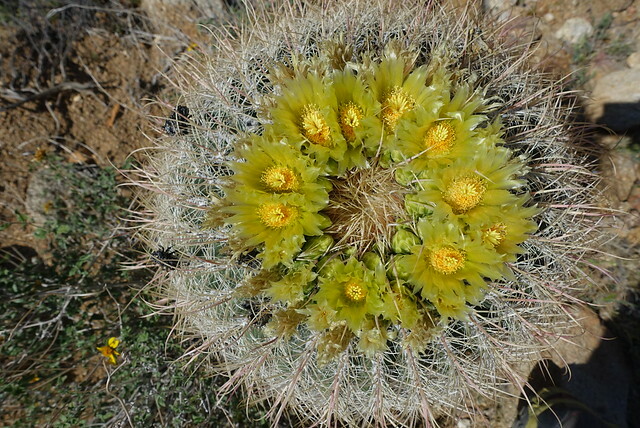 I took heaps of pictures, and must remember to hike the PCT for those three miles the third week of every March. 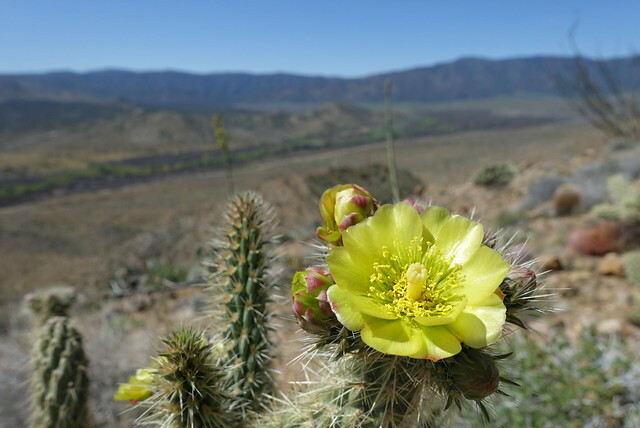 It definitely felt like the Sonora Desert was on show. I really enjoyed those first few miles. 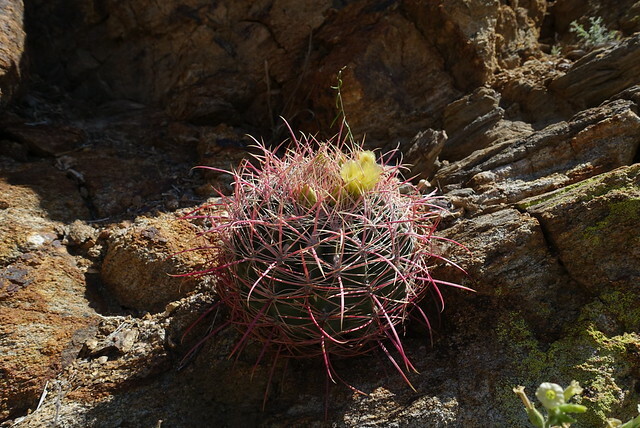 Gradually, though, the cactus garden gave way to more desert-transitional plants, the same that have been along the trail for 20 miles prior, so it wasn't anything new. The track was really level, tracing a contour line, which made for easy walking but got a bit annoying to trace every finger canyonlet and ridgeline. I remember looking at the trail on the GPS and realizing that if the trail routers could just be bothered to add 40 feet of elevation it would cut off a half mile of meandering. Ah well, it's done, and that first section was very much worth it. I planned to camp at the 3rd Gate Cache, and like always those last few miles dragged out. 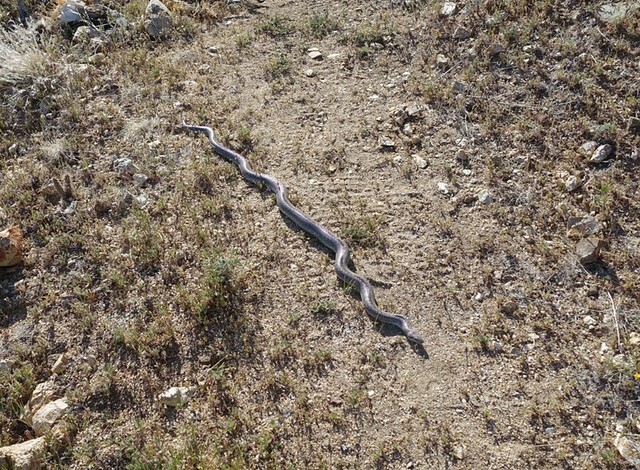 I almost stepped on a snake around mile 89. Doh! Fortunately it was a rosy boa, a very mellow snake; I could've picked it up if I wanted to (they don't bit). But I didn't molest it and slogged up the trail a few more minutes. That would've been the highlight of the day except... I ran into two weekend hikers, stopped on the trail with 30 feet between them. Uh, that's weird. 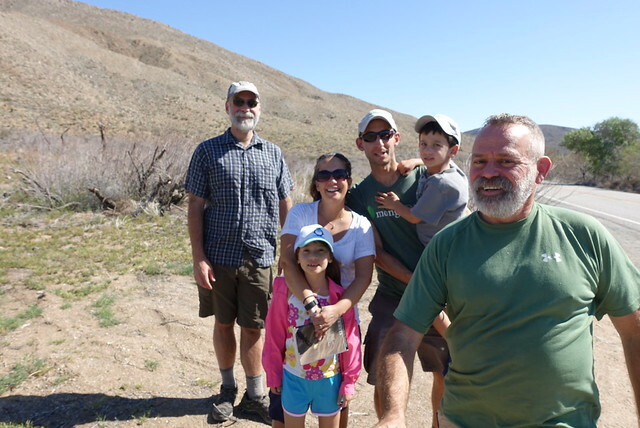 They said "oh, rattlesnake!" Aha. The first had walk right by the snake, and then the snake started to rattle, stopping the second in his tracks. I came upon the situation when they were trying to figure out what to do. Finally us two in the back just went up and over on a steep slope, and by that time the rattler had disappered. I got to 3rd Gate Cache, quickly threw up the tent (the landscape's changed again to very thick shrubbery with lots of campsites scattered about). 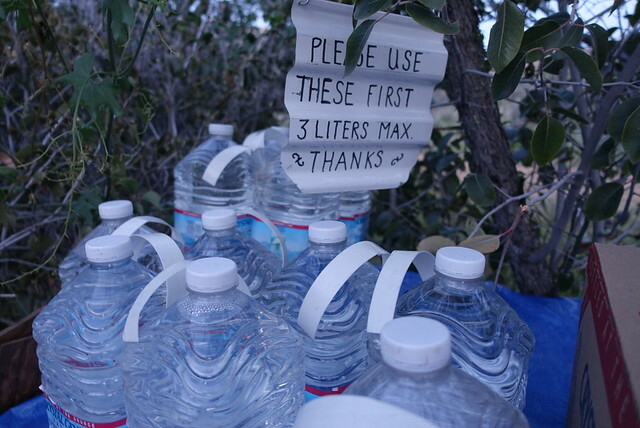 I headed down to the cache to get a liter of water--though I had stocked up in Julian with 2 liters in my Platypus and 3 1/2 in Smartwater bottles , I drank all the SmartWater bottles by the time I got to camp. Two liters should be enough for a walk to the next water at Barrel Springs, ten miles away, but having one extra isn't too heavy and it is a good thing. So now I know that I drink around 1 liter for 5 miles of cool hiking, and 1 liter for 4 miles of warmish hiking. And... that's all. Now it's time to sleep. I think I'll wake up around 6 and get on the trail at 6:30 (about a half hour before sunrise) and hike until the sun gets bothersome. Then I'll make coffee and oatmeal for break, then continue on. I'm thinking I"ll stop somewhere before Warner Springs, maybe 14 miles from here.